Faire un four is an expression from the XVII century theatre world which means ‘to suffer a defeat’. Literally it is ‘to make an oven’ but it almost sounds like ‘to make a four’ hence ‘a quartet’. How do we recognize something as something? Anybody as somebody? “Faire un four” departs from four people and their dances. It is not interested in individualism but in reworking the 4 as a multiple space layering ways of doing things with dance, after a long practice of interpreting, altering, adapting each other’s movements. Four solos (prologue) generate the base for each evening while the actual piece constructs a scenic architecture for performers and spectators to process what they perceive, since to perceive resemblance is to make it happen. “Faire un four” produces a physical and verbal collection in which the productivity of recognition as well as the opacity of things are questioned, confused and challenged. Sara Manente graduated in Communication Science (Bologna) and completed the post-master a.p.t/A.pass in Performing Arts in Antwerp. She works on projects that have a choreographic starting point but also touch the ?eld of visual arts: “Democratic forest”, a practical and theoretical research in collaboration with Alessandra Bergamaschi about movement of masses, crowds and communities. She has also collaborated with Ondine Cloez and Michiel Reynaert in “Lawaai means hawaai”. This piece was selected for the prix Jardin d’europe 2009. She works as a performer for Marcos Simoes, Aitana Cordero Vico and Kate McIntosh. She is one of the founding members of the association CABRA vzw which facilitates the work of seven artists: Sara Manente, Marcos Simoes, Norberto Llopis, Jaime Llopis, Santiago Ribelles Zorita, Kyung Ae Ro and Varinia Canto Vila. Choreography: Sara Manente. 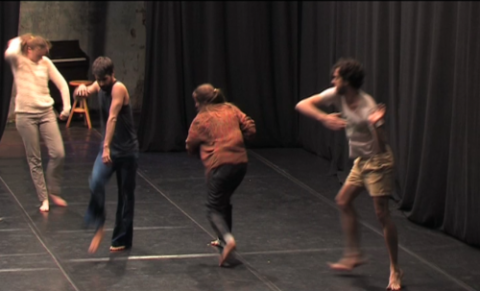 Performed by: Jonas Chéreau, Ondine Cloez, Madeleine Fournier, Marcos Simoes. Music: Christophe Albertijn. Drums: Thomas Campaert. Scenography & lighting design: Jorge Dutor. Film collection: Marcelo Mardones. Dramaturgical collaboration: Constanze Schellow. Coaching: Michiel Reynaert. Production assistant: Lina Schlageter. Illustration: Hadas Cna’ani. Production: CABRA vzw. Executive production: Mokum vzw. Co-production: Beursschouwburg, Workspace Brussels, Monty. Supported by: WpZimmer, a.p.t/A.pass, WorkSpaceBrussels, Impulstanz/Vienna, MDT, Swedish Arts Grants Committee, Flemish Community. Concert with KAKA after the performance. A Swedish musician that just released his second album “The Two”. As always he does everything him self, writes, sings and produces. Listen to Kaka here.